Alice Joseph “Aboubou” was born on February 29, 1936 in Port-Au-Prince, Haiti to the late Claricia Andre and Midit Joseph. Her first granddaughter gave her the name of “Aboubou” which became her nickname in the neighborhood. Alice raised four children of her own and helped raised her step children as well. She was a very courageous and persevering woman who enjoyed life and serving God. Alice diligently worked as a retailer in her younger age to financially provide for her family. Her heart was at purest when giving to others and her smile was genuine. Alice lived and spent most of her childhood at Cite Militaire, Port-Au-Prince before moving to Queens, New York July 1st, 1986. She loved helping and caring for others and worked as a home health aide for 15 years. She spent 17 years living in Queens, New York before moving to Orlando, Florida in October of 2003. 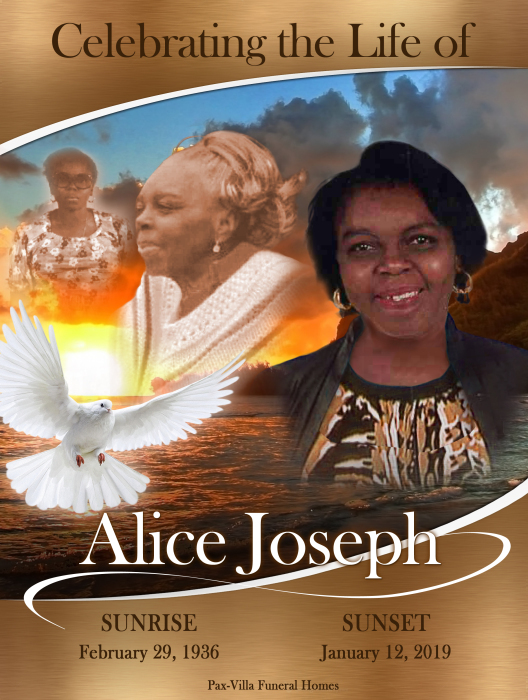 Alice had strong faith, she enjoyed serving the Lord, singing and was a member of her church choir. An amazing woman that loved her family, her happiness laid in seeing her children grow in good health and loving God. The most important lessons she taught her children and grandchildren were to genuinely love; be passionate in everything they do and most importantly their spiritual beliefs would provide a stable lifestyle. Despite of her illness, Alice stayed strong and never lost faith in God. On January 12, 2019, Alice was called Home to be with the Lord. Our family lost an amazing woman of courage that will forever be missed!